During the last decade, urban communities started to digitize their cities as an attempt to meet the digital native’s future needs such as the intention to publicly access real-time information about the city’s current state. The recent availability of small, energy-efficient, interconnected and cheap air pollution sensors makes it thereby possible for a smart city to instantly measure the air pollution level that the citizens are currently exposed to and to share it with the citizens concerned. Unfortunately, today the resulting insights about the current air quality need to be actively queried by the citizens, leading to situations in which the citizen is exposed to a high air pollution without being aware of it. 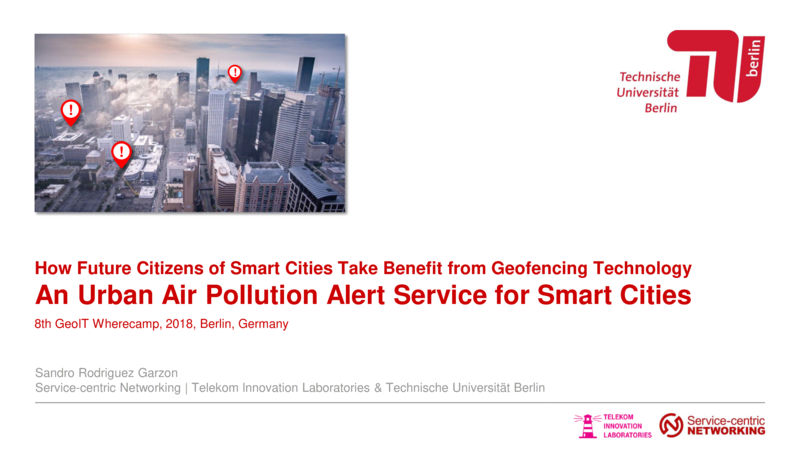 In this talk, I will introduce the context-aware air pollution monitoring and alert service Airtify that proactively notifies citizens via mobile devices about highly relevant air quality information once they enter an area with an air pollution that exceeds a user-defined threshold. The service continuously determines the concentration of particulate matter throughout a given urban area, detects closed areas with a high air pollution and shares this information with the citizen’s mobile devices. The latter component is thereby responsible to regularly measure a citizen’s geographical position and compare it against the areas of poor air quality. Airtify is an exemplary Smart City application that makes use of a combination of urban sensing and geofencing technology to provide an add-value service to environmentally-aware citizens of future urbanizations.